These gluten free crackers are extremely delicious and slightly addictive, you might not ever have to buy crackers again! When I'm creating recipes I can tell pretty fast if a recipe will become a staple item or not... This is definitely one of them. Before even posting this I've made several batches, wrapping them up and giving them away as gifts to friends and family. This is just like granola, hummus or peanut butter, you should have a big batch ready made in you pantry at all time! Heat oven to 200°C. Place all the ingredients in a large bowl, pour the boiling hot water last and mix to combine. Leave for 15 minutes for flax seeds to soften and bind everything together. Remove to a rack to cool then store in an airtight container. When it comes to health and diet, one simple piece of advice is more relevant to ALL people than anything else: Eat more fiber! People are so concerned about proteins when in fact, fiber is something that most people are deficient in while protein is the exact opposite. Fiber is a carbohydrate found in plant foods like fruits, vegetables, nuts, seeds and whole grains. Unlike other carbs, it isn’t digested by your body so it passes quickly through your system without causing your blood sugar to rise. These crackers are great for balanced blood sugar levels and contain both sources of protein, zinc and good fats. I'm very sure that once you try this recipe you will appreciate it as much as I do! 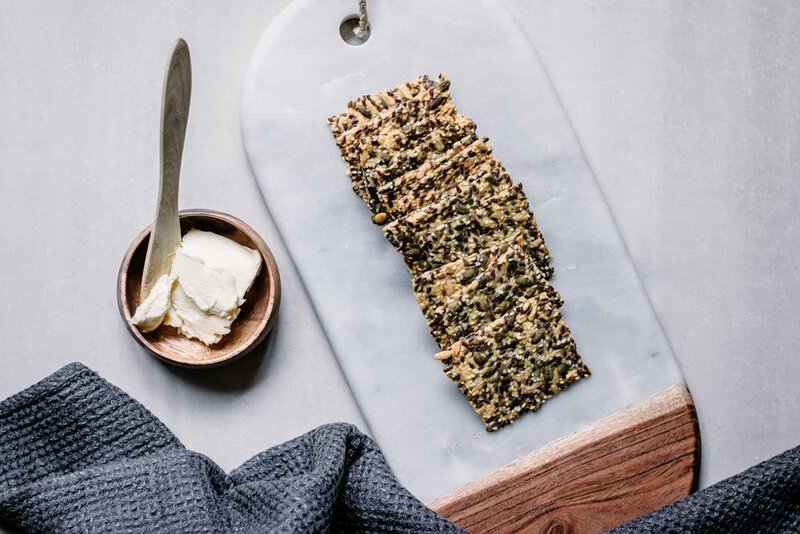 The great thing about these crackers is that you can get a fair share of flax seeds, pumpkin seeds, sunflower seeds and sesame seeds without even thinking about it! You have to try this vegan chocolate & dulce de leche fudge! Good fats from coconut & cacao. Swirled together with a sweet tahini fudge! There's a new vegan product in Sweden! Condensed coconut milk! Hurray! This is probably not new to those of you living in the US but here in Stockholm this is pretty awesome news! In this post I'm going to show you how you can make sweetened condensed coconut milk at home. I'm also going to talk you through the differences between condensed milk and caramelized milk. If you try condensed coconut milk just as it is, then I would say that it is quite far from the "traditional" condensed milk or dulce de leche which means sweet milk in Spanish. But different isn't bad, it still has a nice round caramel flavor and delicious caramel sauce like consistency! Traditional dulce de leche is prepared by boiling cow's milk and sugar on low heat for a long time. Now to the difference between condensed milk and caramelized milk. There's one product that is white/cream colored and is called condensed milk, leche condensado, in Spanish. Then there's another product with a caramel brown color with a thicker texture, this is caramelized milk, which in Spanish is called dulce de leche. The only difference between these two products is that the light one is boiled shorter time than the dark one. So, in step one you get condensed milk (the water has evaporated) when you cook it further, you'll get caramelized milk. Now that that's straighten out, let me show you how easily you can make these two products at home! All vegan of course! All you need is coconut milk and some maple syrup. Maple syrup is the liquid sweetener that fits this recipe best. It has a natural caramel-like taste. If you use for example agave syrup instead it would get overly sweet. There is more liquid in maple syrup than in ex. agave or honey, which means that you need to cook it a little longer, but once it's done you get a very deep delicious taste. Stir the ingredients together in a saucepan. Let the liquid boil slowly on medium heat (not at 6 but rather 3 to 4 if you have a stove running from 1-6) and as soon as you notice it starts to boil, lower the heat to low heat (on my stove it will be 1an-2an). Simmer for low heat for about 60-70 minutes to get condensed milk. Be sure to stir every now and then (every 5 minutes). If you want to make caramelized milk (dulce de leche) then let the liquid boil for another 30-50 minutes and you can also raise the temperature a little. Tip * If you want to try to make both products you can double the recipe and then pour over 1/3 of the liquid into a glass jar after 50 minutes and allow the rest to cook further. Store the condensed milk in airtight glass jar in the refrigerator for up to 1 week. The caramelized milk lasts for several weeks. Use two saucepans, add all the ingredients to the two different blends in each saucepan. Melt all the ingredients in the saucepans on low heat until it's liquid. Pour the chocolate mixture into a mold with baking paper. Pour the tahini mixture in uneven spots over the chocolate layer and take a toothpick or chopstick to make swirls. Put the fudge mixture it in the freezer for 20-30 minutes or until the fudge solidifies. This fudge is so crazy yummy that it's hard to stop eating! It completely melts in your mouth and tastes like the perfect combination between sweet and salty! Plenty of chocolate and caramel flavor! 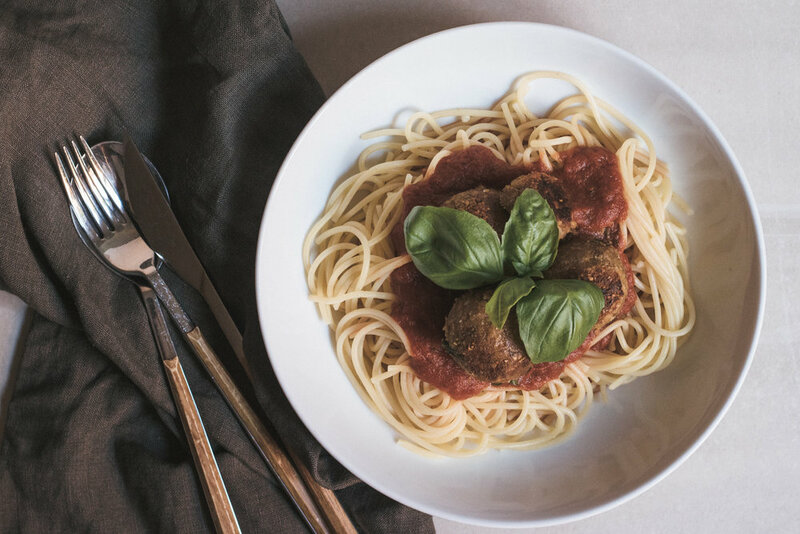 These vegan "meatballs" are deliciously packed with plenty of savory umami flavor even though they're completely free from meat, egg, diary and gluten! 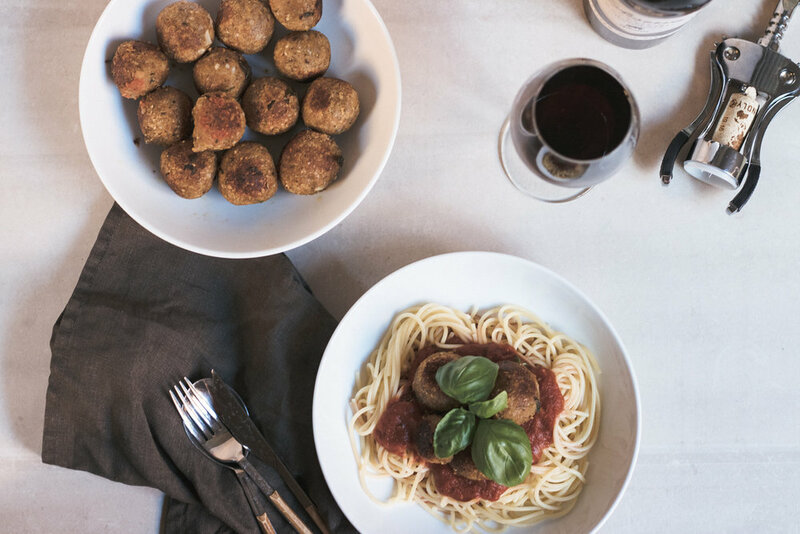 Crazy good meatballs, which I call "Mate Balls", are as easy to make as the traditional ones! They're made on a base of chickpeas and sunflower seeds. They're completely nut-free, which is a good thing if you have small kids or nut-allergies in the family! A food processor and a stove is the only equipment needed for this recipe. No fuss, just blend all ingredients in a food processor and then fry the balls with a small amount of unflavored coconut oil. The recipe makes about 15 mate balls. Something that works great is to make a bigger batch and freeze the balls before cooking them. Then you'll just have to fry them when you need a quick dinner in a couple of minutes! Yum! Pulsing greens with frozen bananas is a great way to get those chlorophyll nutrients. But if you’re trying to cut down on sugar, that means also saying good bye to super sweet banana based smoothies! Hi guys! today I'm sharing with you a low fructose smoothie. Or maybe better described as a non banana based (but still very creamy) smoothie! I don't expect a "newbie" to drink this smoothie and love it! Haha, let's be honest... 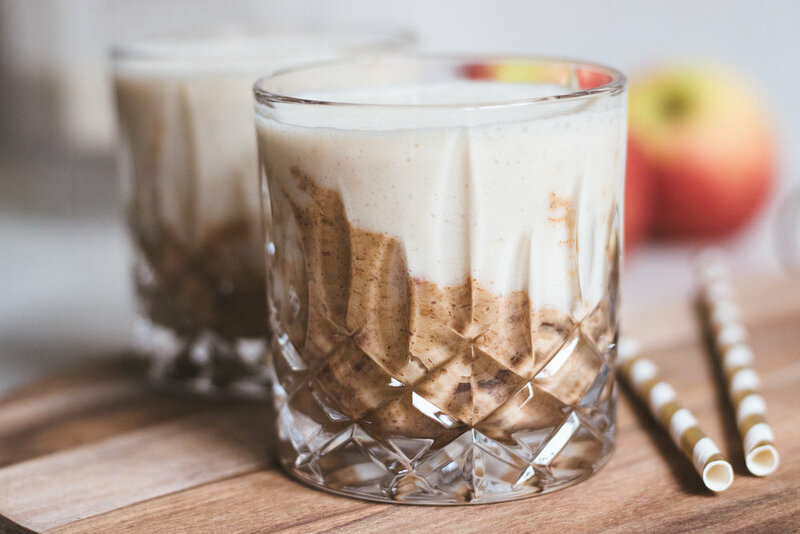 But if you're an unconventional, cutting edge smoothie drinker that's only looking for a power house of fuel instead of a solid meal, then this one is for you! Place all ingredients in a blender and blend on high speed until really smooth. This smoothie is definitely thick enough to eat like a smoothie bowl if you want! Top with cacao nibs and coconut chips and enjoy! As some of you might know. I've been changing my diet lately. The change isn't huge. Well, in the beginning it was, but now it's almost back to normal, except I'm trying to eat less sugary foods since I've noticed that it really wasn't making me feel good. It all started when I decided to make a parasite cleanse in the beginning of April. It was a 30 day cleanse with herb supplements and no coffee, no fatty foods, no sugar (not even from fruit) and no white carbs. It was pretty hard in the beginning but felt right on so many levels! My body had been screaming for something like this... Last year I developed symptoms like: fatigue, depression, anxiety, chin/neck acne and even panic attacks. I took naps every day and literally couldn't stay awake even when I tried to. My period became irregular for the first time in my life. I went through many months feeling drained, exhausted from doing absolutely nothing and had no motivation what so ever to work out or go out and socialize. I made several changes this spring (went to a Kinesiologist among other things) and I firmly believe that all the things I did played a part in the improved state that I am in today. Having that said, I can tell you for sure that cutting out sugar, fruit and simple carbs has made a huge difference! First of all, I'm very, very rarely craving sugar, sweets or desserts anymore! Second of all, I have lots of energy! I easily work out 2-3 times a week at the gym and do yoga 2-3 times a week on top of that. Finally, I am almost never bloated anymore! This used to be a big problem for me... It's not that my body can't handle sugar or carbs, it's just that my body can't handle sugar or carbs every darn day! For example, I used to drink a smoothie based on bananas every single day. I also ate acai bowls regularly (with bananas, of course). As you can imagine this adds up to quite a few bananananas... Nothing wrong with that fine yellow fruit! It's just that now I've understood that maybe limiting my fruit/simple carbs intake to maybe once or twice a week works much better for my body. I also started reading this book called WomanCode by Alisa Vitti, I decided to read this book after seeing a nutritionist that told me that I should look up PCOS. My symptoms were pretty obviously related to some kind of hormonal imbalance. So I started reading the book and it taught me so much about hormones, the menstrual cycle, gut flora, and eating food that works better with our female rhythm. Alisa has developed a way to live in harmony with our endocrine system. She talks about the best exercises and foods to eat according to our cycle. She talks about how to incorporate rituals into your daily life that will help lower stress on your endocrine system. She also talks about how to harness our female energy and lower our masculine energy. I highly recommend every woman to read this book! So basically the solution for me has been to eat more foods that stabilizes my blood sugar, that means more (natural, unheated) fat and less fruit & carbs. Other than that, working out regularly has been really important for me as well as other activities and rituals that lowers stress in the body. If you have experienced some or all of the symptomes that I've talked about, I really recommend the WomanCode! And guys! Don't worry, I will still post delicious recipes of raw cakes and desserts! I have not excluded fruits entirely out of my diet, I've just cut down on it! And I'm expanding my horizons when it comes to smoothie and all that kind of good stuff that I eat every day... Like not having fruit smoothies or not having lots of sweeteners in my granola for example.